For married women who feel like single parents. Bookstore shelves are full of parenting resources for moms who are newly divorced or widowed. But where do moms turn if they feel like a single parent--but they’re not? Whether he is away on business, deployed in the military, or obsessing over a computer game, dad may not be available for a variety of reasons. Moms who parent in this situation still need help and don’t necessarily relate to the advice given in divorce recovery or single parenting resources. Married Mom, Solo Parent is a common-sense, down-to-earth look at the struggles wives and mothers face when their husband is not actively involved in family life. Writing from her own experience as a married single mom, Carla Anne Coroy will help wives and mothers sort through their questions, such as: Can I do this alone? How do I raise kids to honor their father? How do I give my children a healthy perspective of marriage if they never see one in action? 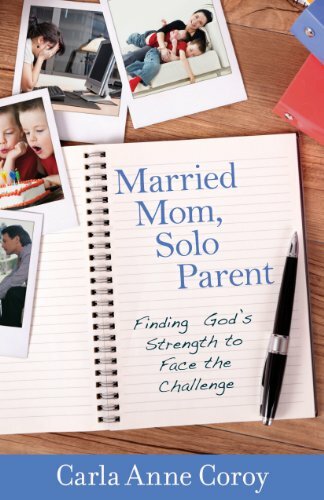 With practical suggestions, anecdotes, and biblical teaching, this book will encourage moms to see their position as a high calling, to find healing for their worries and frustrations, and to tap into God’s strength for help in facing the daily challenge of being a married mom, solo parent. Great book! That's what I call it when an author can make you feel like she's a good friend who knows what you're going through... and she understands. When I first saw the title of this book, I wanted it yesterday! For a long time I have struggled with being married, yet feeling and often spending my days [and many nights] alone. I was a single mom for 12 years, and many of the struggles are the same even though I am now married. My husband has worked two jobs for most of our marriage and I often find myself feeling like he is the absentee father, "Mr. Funshine", who only has the kids when it's fun. I get them for all the homework, chores, and discipline. What I did not expect from this book... was the wave of emotion that I felt as I read it. Carla Anne Coroy knows exactly what it feels like to be in this situation. She knows the anger and resentment towards your husband, she knows the feeling that you don't quite fit in... at church or with friends, because there really isn't a good 'fit' unless you're a married 'couple', a single mom, or just... single. Carla addresses these issues and many that I didn't even realize I had, and she does so with a heart to help you turn your own heart to God and honor your husband. If you are a Married Mom, Solo Parent... be encouraged... read this book! See what others are saying. Follow the blog tour schedule here. Carla Anne Coroy runs the Married Single Mom blog at www.carlaannecoroy.blogspot.com. She speaks regularly and serves as a staff writer for an online Christian women’s magazine Mentoring Moments for Christian Women. 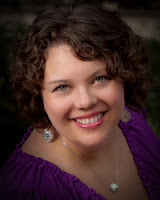 Carla Anne lives in Canada with her husband and four homeschooled children. For more information, visit www.carlaanne.com. Come to an encouraging MomChat party on Facebook…you could win a KindleTouch! To celebrate the release of her new book Carla has partnered with her publisher, Kregel, to host a live MomChat party on Facebook! Click here. The party will wrap up the blog tour and Carla will be hosting an encouraging MomChat about all things mom and wife related. There will also be a fun contest and she’s giving away a KindleTouch and a ton of other fun stuff (books, gift certificates and more!). So RSVP today and then come back on 10/25 at 5pm Pacific, 8pm Eastern for the party. Don't miss the fun ... and tell your friends. Oh, I'm so glad you found the book applicable and relatable. It's true, isn't it, that the emotional part and fitting in is such a big part of the married solo mom life? It's a blessing to me that you found connecting with my life helpful. Wow... I have to say... You are a perfect reviewer for this book having lived first the single mom life and then the married solo mom life! You do really understand! Great job done! This book was a pleasure to read because it spoke right to my heart. Your book gave me some much needed conviction and I believe God will use it to help many other married solo moms as well. Thank you for sharing from your heart... especially those things that many of us are afraid to put a voice to! God bless! I'll see you at the Facebook party!